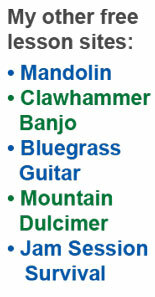 In other words, the 2nd, 3rd, and 4th strings of both instruments are tuned to the same pitches. Once you have matched those strings you need to tune your 1st and 5th strings. To tune the 1st string, have your guitar player fret his 2nd string at the 3rd fret. This makes a D note and you match your 1st string to that pitch. If he refuses to cooperate you can do the same thing on your banjo since you have already tuned your 2nd string. Just hold a finger just behind the 3rd fret of your 2nd string and play the note. Match your first string to this note. To tune your 5th string, have the guitar player fret his 1st string at the 3rd fret. This is a high G note and you tune your 5th string to match that pitch. You can also, fret your 1st string at the 5th fret and match your 5th string to that note. Note: If the bridge is not located in the correct place on the head, your fretted notes will not sound in tune no matter what you do. In my downloadable Banjo Instruction Course I include a section which teaches banjo maintenance and setup you will learn how to correct this and other problems.